The ultimate orchestra sound app for iOS. iSymphonic Orchestra was designed as professional virtual orchestra sound app for your iPad and iPhone, with the goal to deliver you superb, extremely realistic and stunning orchestra sounds, both for your live performances, as well as a boost of creativity while composing new songs anywhere. This app supports Apple's Audio Unit v3 plugin standard, Audiobus, Apple's Inter-App Audio system, as well as Bluetooth LE MIDI devices¹ ! 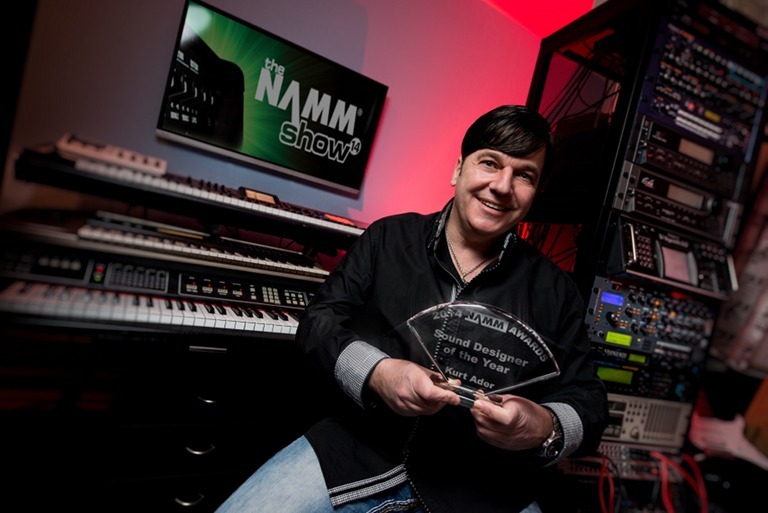 The sounds used in this app were explicitly recorded to fulfill these requirements and involved several months of recording and post processing under supervision of award-winning sound designer Kurt Ader, and included a variety of innovative, new recording techniques. So far these sounds were only available to very few, famous movie composers. Now they are finally available to everybody. The supreme quality of these sounds, combined with the unique way they were recorded and assembled, gives us confidence that you haven't heard anything comparable as of to date, even not on Mac or PC. A short teaser video for giving you an impression of the sound quality of iSymphonic Orchestra. Demo song composed & performed by Kurt Ader. 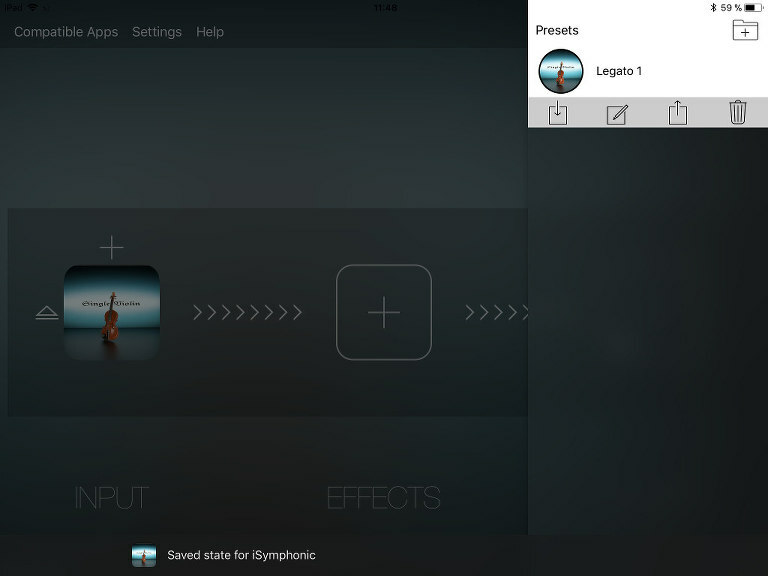 A live demo video demonstrating you some of the individual sounds of iSymphonic Orchestra (v1.0.0). Live performance by Christopher Hans. 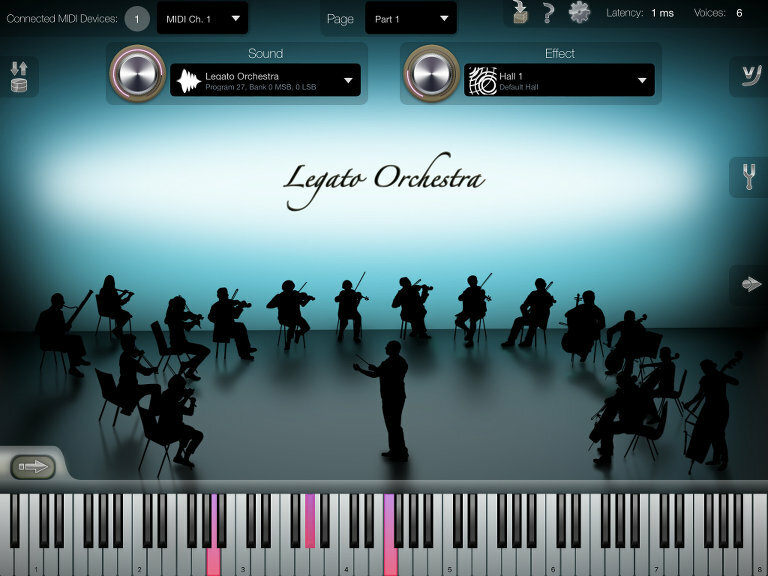 iSymphonic Orchestra was designed as intuitive iOS app for your Apple iPad, iPhone and iPod touch. 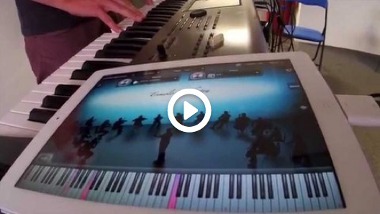 Simply connect your external MIDI keyboard with your iPad/iPhone/iPod touch and enjoy playing world-class orchestra sounds. Even though iSymphonic Orchestra allows configuring various aspects, there is no configuration whatsoever required though to use and play it immediately. Stunning high quality stereo sounds. Universal Binary (only purchase it once and use it on all your iOS devices). Includes an easy to use built-in multi-track recorder. (including support of remote restoring via MIDI). Supports Audio Unit v3 for being used as convenient instrument plug-in with third party mult-track DAW apps (multiple AU instances supported). (including state saving directly within Audiobus). Supports Apple's IAA system for audio & MIDI streaming between other apps. Virtual on-screen piano keyboard with velocity support, scalable & scrollable, and transpose control. Static Scale Tuning and Master Tune. iSymphonic Orchestra provides a large amount of sounds. You easy and quickly find any sound you need though by using the app's interactive filter options. The list of sounds updates in real-time while you are typing your search keywords or while selecting filter options from the popup menus. Filter options which are already ruled out by your current search criteria are automatically grayed out. You can also rate the individual sounds with 1 to 5 stars and then easily find your favorite sounds by using the sound rating filter. Unlimited recording / playback length. 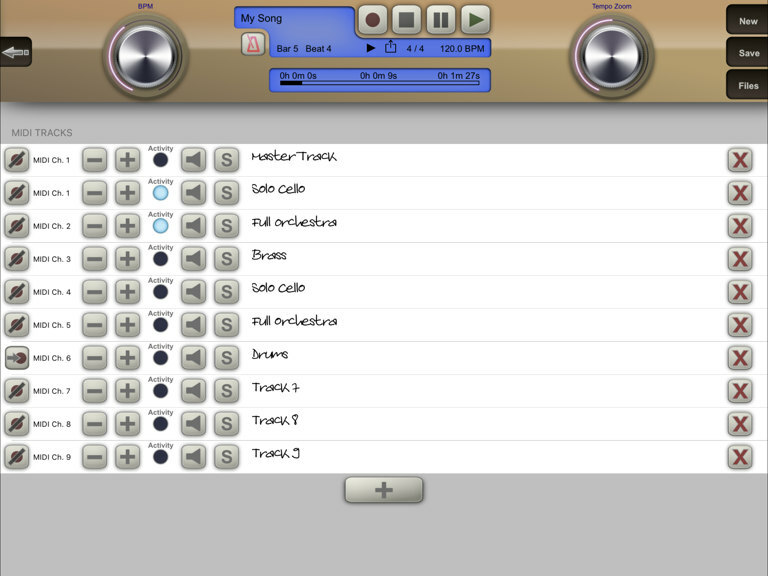 Share your recorded songs easy and quickly either as prerendered audio file or as MIDI file with your colleagues and friends. Tiny file size: Even your largest song with dozens of tracks and hours only consumes few kilobytes (kB) disk space. 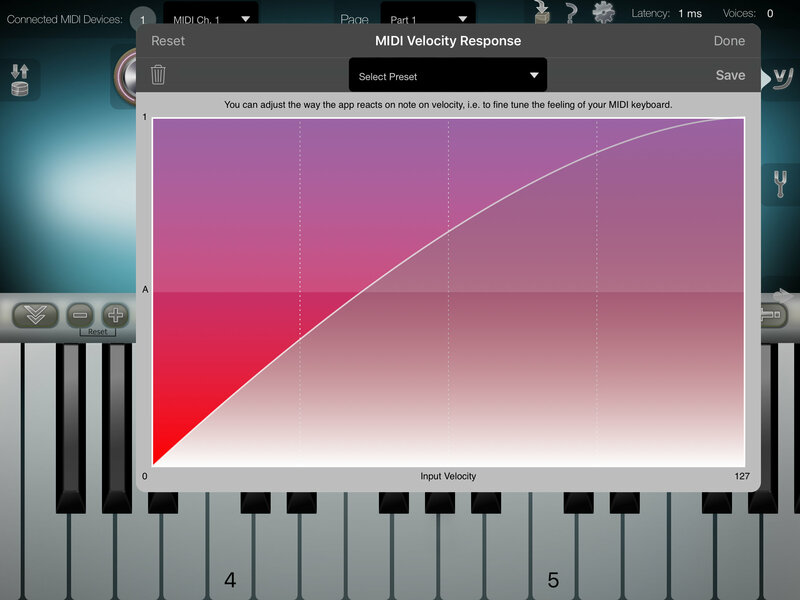 Use the virtual Metronome, either only the visual one, or with an audio click, to record your tracks in beat. You are not limited to the built-in MIDI player / recorder of course. If you prefer, simply use iSymphonic Orchestra as virtual instrument in your favorite Audio Unit host app, IAA host app or Audiobus compatible app. You are on the road with no "real" MIDI keyboard around? No problem, just scale the virtual on-screen piano keyboard with two fingers to the size preferred by you and scroll it with one finger to the keyboard section or octave you want to play on. You can also transpose, both the on-screen keyboard, as well as your external keyboard by tapping on the "+" and "-" buttons on the virtual keyboard's toolbar. iSymphonic Orchestra includes Hermode Tuning, which is a dynamic tuning algorithm making the sound even more brilliant by automatically controlling the pitch of the notes slightly and gently in multivoiced music in real-time, for achieving better frequency ratios than with fixed tuning. This dynamic tuning algorithm imitates the tuning behavior of well educated, professional musicians of i.e. orchestras and choirs. 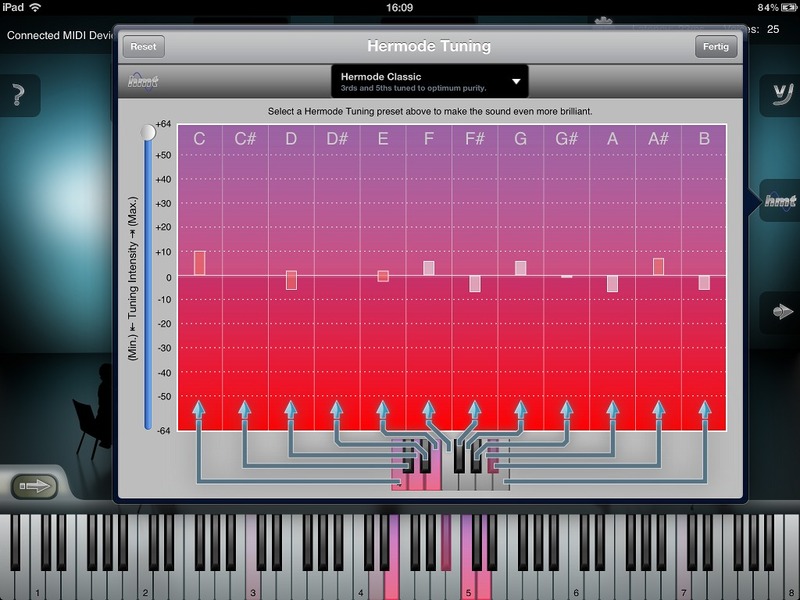 You can enable and disable Hermode Tuning at any time and you can fine tune the impact of its frequency corrections. 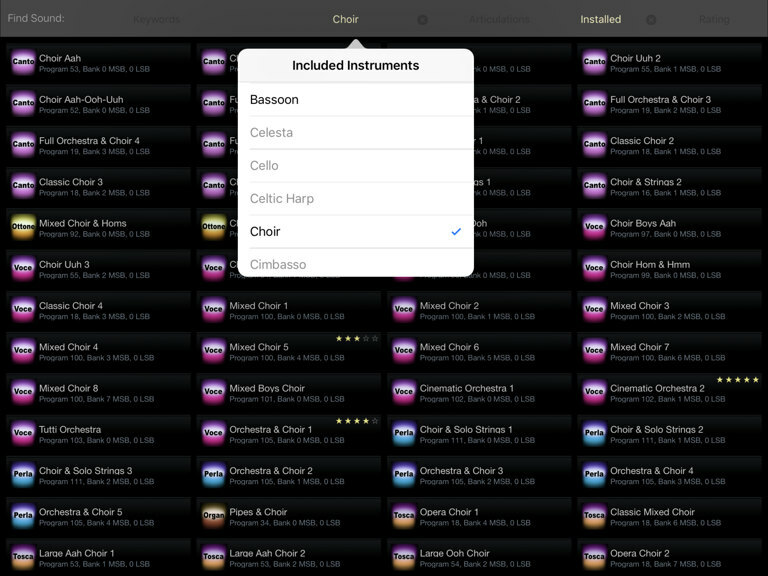 The app also supports static scale tuning, which is required for almost all non-western musical genres. You can either define your own scales by simply dragging the bars on the screen, or you can choose from factory presets of common static scales. Also the base tuning of the app can be adjusted, which is commonly called Master Tune, which is especially required by professionals for playing together with a variety of other instrument types or certain musical genres like classical baroque for example. In such cases one may need to adjust the app's base tuning to 434 Hz for example instead of the standard reference tuning of 440 Hz. No matter which tuning setup you are using, whether it is the dynamic Hermode Tuning algorithm with the algorithm variant and depth of your choice, or whether it is any static scale, or any master tune; you can save your tuning setup altogether as user presets and restore them whenever you need them. You want a more powerful user preset? Then have a look at the next feature described below. You can easily save & restore the entire state of the app as user preset. We call those user presets "App States". You can see an App State like a snapshot of the app which contains all sound settings of all 16 parts, and even all the content you had on all tracks on the recorder screen. Each App State is represented by a rectangular, virtual paper strip which you can label intuitively with an Apple Pencil. 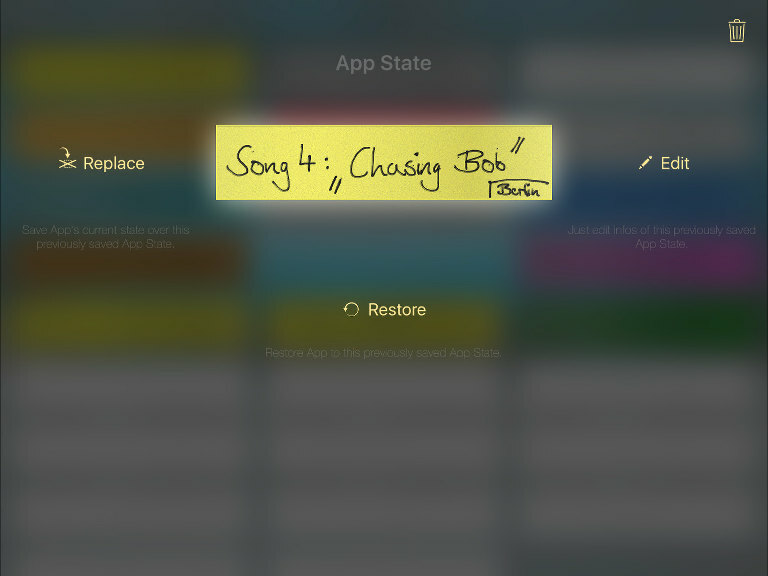 App States are especially handy for live shows, where you can simply prepare the app for your next song by tapping on the respective paper strip during the show. You can even assign MIDI program and bank numbers to restore App States remotely with a tap of a button directly at your external MIDI keyboard. Making music is a collaborative process, which must also apply to the tools you are using. That's why all our audio apps support common inter-app functionality standards like the Audio Unit v3 plugin standard, but also Inter-App Audio, as well as Audiobus. So you can easily use the iSymphonic sounds directly in the DAW app of your choice like Apple's Garage Band or Steinberg's Cubasis. The entire iSymphonic setup is automatically saved and restored with your song in your DAW app. Sounds in this app are using several voices per note. This is technically required to resemble the natural and living impression of the overall sound. The maximum polyphony depends on the exact device model being used. Minimum Requirement: iPad 1 / iPhone 3GS / iPod touch 3rd gen.
² The marked younger device models actually support a much higher polyphony than listed above, however the polyphony is throttled to 140 stereo voices by default, for performance reasons, and to leave other apps with sufficient amount of resources. You may override this and increase the polyphony on such device models by accessing the app's settings screen. iSymphonic Orchestra is currently available for the following mobile devices. In case you encounter any problems while using this app, please report it to us by using the feedback link above. 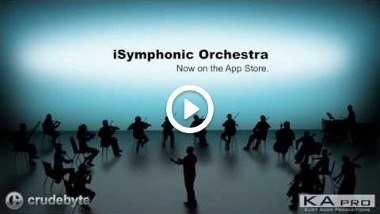 You can get iSymphonic Orchestra as universal binary through iTunes from the Apple App Store. You need at least iOS 4.3 or later to be able to use this app. Latest iSymphonic features require at least iOS 9.1. 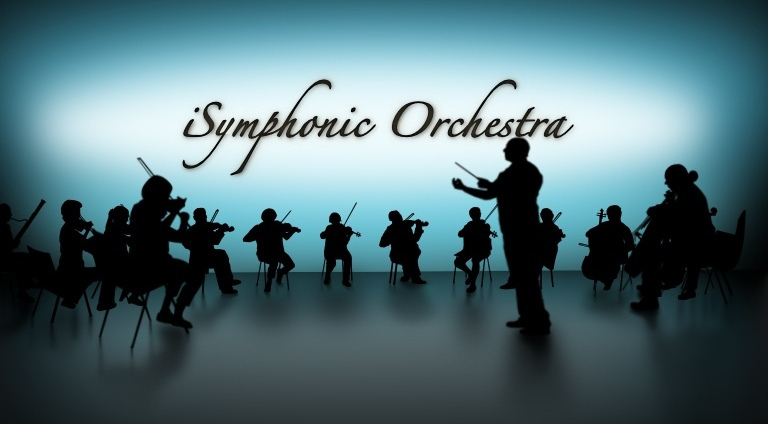 You have questions about iSymphonic Orchestra? Don't hesitate to write us by using the feedback link above.